Put simply, stages make Dragon Age conversations awesome. Instant camera work, hand gestures, body movement, not to mention facial emotions mean they are the backbone of any conversation. When you add in the ability to easily implement cutscenes for a single line using them, they are nothing short of brilliant. Under stages, in the _Generic folder, you'll find the wonderful "1p_200_all" stage, which has everything you need for a standard interaction with a single NPC. Simply add this stage into your area, move and rotate it until it is in the correct position, and then open up the conversation and set it to use that stage. The next step is to then generate all camera work, poses and gestures from the root node, using the respective commands from right-clicking on the root node. Then you can set the preview tab to use the correct area and stage so that you can preview lines of your conversation without going into the game, which will now be complete with all the aforementioned goodies. You can also customise the animations shown in individual lines. Making it easy to add in an animation to your NPC for a give or receive arm/hand movement that will occur so often as a result of quests. Should that animation be insufficient, then it's a simple matter of converting the line to a cutscene using Ctrl-Alt-C (or using the edit menu), to instantly create a cutscene resource that again will have all the previously generated actions. If I sound like I'm raving a little, that's because I am. Having created a cutscene from scratch, I realise how much effort I could have saved by simply using a stage and creating the cutscene using it. As a result of discovering stages, I've made a significant amount of progress in the development of "Alley of Murders", and the conversations are looking much better! Gamespot have once again shown their ability to recognise great games in giving out their 2009 "Game of the Year" awards by... WAIT a minute... WHAT? Shame, Gamespot, oh the shame. 2009 Game of the Year goes to "Demons' Souls." Even worse, it was awarded "Role Playing Game of the Year" as well. Let's count the things wrong with this decision. Given the number of excellent games published this year, giving "Game of the Year" to Demons' Souls is ridiculous. However, giving it "Role Playing Game of the Year" is disrespectful to the genre. For starters, it's not a roleplaying game. It's a action/fighting game. Apparently, Gamespot believe the only requirement for being a roleplaying game is to have character levels and be in a fantasy setting. Too bad that second requirement is there, otherwise they could have given the award to Modern Warfare 2's multiplayer aspect. Gamespot should be ashamed of themselves. Not just for this, but for many other awards they disgracefully dished out to undeserving titles. I won't be referring to Gamespot's "expert" opinion any time soon, as they're obviously way off base when it comes to identifying good games. The Dragon Age toolset is a nasty beast, but that is somewhat expected given the complexity and power of the engine, and the fact that the game is still very fresh in the hands of gamers. I've hit upon various issues (and some solutions) lately, and I thought I'd take the opportunity to share them and some advice. The first was overcoming my pain with cutscenes and animation, namely, that I couldn't figure out how to get two animations to blend. I could overlay the two animations in different tracks on a character, sure, but it was a matter of tweaking timing and animation weight to make the animation look as smooth as possible. This is not necessary. Simply select your two animations (using ctrl-click) and then right mouse button on one a select "Create Transition". (Or simply hit 'X') I would have thought this to be an essential part of cutscene creation, but this information wasn't included in the 'cutscene tutorial' on the Dragon Age wiki. It is now. The next was a curious issue I found when going back and playing my second play through of the Dragon Age campaign... in that my mage hit level 10 and didn't receive any attribute points. Even more curious was that Leliana received two points for each one point I allocated to a statistic... I discovered that this seems to be related to a problem with single player add-ins using "module_core" as their "script" as shown in module properties. Even though I read that this was the correct thing to do. I guess not. So I updated the "Creating a Module" page on the Dragon Age wiki. Finally, I confirmed that doors in interior areas do block all visibility of the player until they are opened. Or, if you make a door inactive, they are guaranteed to block visibility. Why is this useful? Say you want an internal area, but don't want to undertake the (substantial) effort of level creation. Then simply use one of the existing level layouts and cordon it off with doors. Admittedly, you could probably use the downloadable level layout source and trim that down and rebuild the lighting... But this is another alternative. Potentially it saves a little on module size for downloading, at the expensive of perhaps a slightly increased loading time in game for players. My final point for this point is to ask people to make sure whenever they discover something new, or figure out something with the toolset - please - find the appropriate location within the Dragon Age Wiki (or create a new page if you have to) and update it. Having a one-stop-shop for builders to find the information they need will no doubt encourage new builders as well as help veterans. There's nothing more frustrating than having to beat your head against a brick wall only to find that someone already had the solution hours, days, or weeks earlier, but simply hadn't made that information well known. Until we get a fantastic "Builder's Guide to the Dragon Age Toolset" document produced by a dedicated group or individual, BioWare's wiki site seems to be the most easily accessible and visible location for information on the toolset. I hope people make it as useful a resource as possible. The past few days have seen me undertake the time consuming process of creating a cutscene. Given the cutscene lasts for under a minute, the amount of time it has taken me is quite phenomenal. The lack of an easy way to make characters do simple actions is frustrating coming from the NWN2 toolset, yet the ability to do more complex actions and also to view the cutscene at will is a refreshing change. Being able to see my characters actions and animations without running the game is wonderful. The simple actions that proved frustrating were making characters walk and run, and making them equip weapons. To arbitrarily make the characters walk or run, it seems that you have to loop the walk/run animation on the character, and then move them an appropriate distance during that section, adjusting the animation speed as necessary. Unless you happen to be lucky enough to want to make your characters walk the set path of one of the GAD supporting walk animations, this is amazingly frustrating and time-consuming. Equipping weapons is a two part process. First you need to find the appropriate equip animation for the character's loadout (e.g. two-handed weapon, dual-wielding, sword and shield, etc) and set that as the animation. Then in a separate track for the character, you need to assign the "equip weapons" action at the exact frame where the character grabs their equipment. Of course, if you're dual wielding or using sword & shield, the two items are not grabbed at the same time, so you need to find the correct frame for each item and add in a equip weapon action for both items. I've found that typically it is best to use the standing neutral pose as the default pose for characters, as this is what most animations seemed to start and finish from. Since you don't seem to be able to blend the end of an animation into the default pose nicely, if you're not using this pose, it seems you'll need to do some fancy camera cutting before animations finish in order to prevent your characters looking jerky. One thing I have found with the Dragon Age toolset so far is that good planning makes the work a lot easier, even more so than with other toolsets I've used previously. Given the toolset seems to have been designed to cater for planned projects done by large groups, it makes sense that the best way for modders to use it is to adhere to a similar modding creation workflow. With that in mind, I'd like to discuss my explorations with the plot editor and quest design. First, I'd suggest writing an outline of your quest, listing the plot, characters, locations and events. With this done, you can break the quest down into various stages, which will then correspond to plot flags within your module. Let's take a simple idea of a player being contracted to steal a valuable vase from a local merchant. The thief wants it done with a minimum of bloodshed. The player can talk/bribe their way past the guards the warehouse and steal the vase, or simply fight their way in. As the player steals the vase, they are caught by the merchant. If the player killed the guards, he can intimidate the merchant into letting him go. 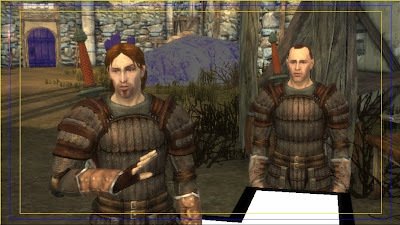 If the guards are alive, the player can persuade the merchant into letting him go. If the player fails at either of these, the merchant will flee and warn the local officers of the theft. Alternatively, the player can choose to kill the merchant to prevent him from warning the authorities. The player can then return to the thief, and get a reward based on his performance. Thief - Asks the player to steal the vase. Merchant - The victim for the theft. Guards - Two warriors employed by the merchant to protect his warehouse. Warehouse - where the theft will occur. Now we need to work out our possible stages/plot flags. That was fairly simple, right? With that quick outline, it's now easy to create a new plot with those flags. Then it's a simple matter of setting and checking those flags in the conversations with the guards, the merchant and the thief. It will be a simple matter to check those plot flags to give the player a slightly better reward if he managed to carry off the theft without killing anyone and without alerting the authorities. If you work out these plot flags before you start working on your conversations and the nuts and bolts of your quest design, the whole process will be a lot simpler. In addition, it will make it easier for you to assign plot assist markers, because you'll know the location/character that the player must visit in order to advance the plot. So begins the process of my first real creation for Dragon Age: Origins. Today I started work on the Add-In module "Alley of Murders". Well, that's its working title at least - I don't think I like it enough to keep it, but it will do for now. This is just intended to be a small diversion within the main Dragon Age single player campaign, perhaps 30-60 minutes. As you may have guessed from the title, it takes place in a city, so you can expect to encounter this area within the walls of Denerim. Needless to say, there's a problem with some undesirably killings in the area, and it will be up to the player (and company) to find them person responsible. I'll be trying to source VO actors for a few roles, though there will be more on that once I've actually written up most of the dialogue. You can expect some interesting conversations, a couple of tough decisions to make, and of course, combat. Welcome to the Creations of AmstradHero blog! This blog will be dedicated to delivering information on various creative endeavours, though it is likely to be focussed on game modding and associated topics. 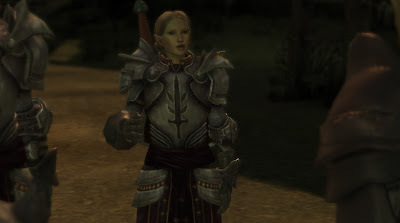 Keeping that in mind, I will announce in this first post that I will be undertaking the creation of a small add-on to the main campaign of Dragon Age: Origins. I am aiming to produce a mid-level mini-adventure for people to enjoy, a process which I also hope will make me far more familiar and proficient with the toolset. Because once this add-on is complete, I will be embarking on the journey of creating a brand new adventure... and planning is well underway in its creation.